Larvae of Cameraria ohridella, the Chestnut Leaf Miner, burrow within the leaves of horse chestnut trees, and the damage caused by large numbers of larvae can be striking. Up to 700 leaf miners have been recorded on a single leaf under favourable conditions. Severely damaged leaves shrivel and turn brown by late summer and fall early, well before normal leaf fall in the autumn. 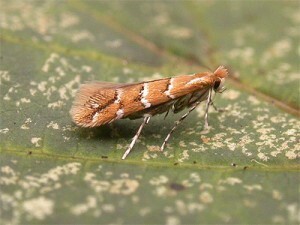 The spread and establishment of Cameraria ohridella is of particular concern because once established, the moth appears always to maintain exceptionally high rates of infestation without any evidence of decline.